On November 9, while seniors visited colleges and Grade 8 took the HSPT exam, freshmen, sophomores, and juniors went on full-day retreats. Among the experiences offered to the students, the Junior Class traveled to the Food Bank in Hillside and worked in separating the donated food so it could be distributed to those in need. After working at the Food Bank, the juniors traveled to St. John Cathedral in Paterson where they toured the Cathedral with Msgr. Geno Sylva, Rector of the Cathedral, who also celebrated Mass with the class. 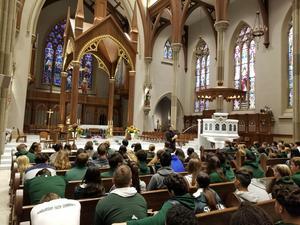 The sophomores stayed home at DePaul Catholic where they heard witness statements from staff, and members from Straight and Narrow. Straight and Narrow also had a upbeat gospel band and got all the sophomores on their feet singing the praises of our Lord. The freshmen stayed home as well, where they too heard witness talks from several staff members. They were led to discover their authentic self by Mr. Ed Craviolo, a former Theology teacher at DePaul Catholic. The freshmen also saw excerpts from the movie Wonder in an effort to encourage them to think more deeply about who they are.